RESERVATIONS: A block of rooms have been reserved for June 9, 2015 - June 13, 2015. The special room rate will be available until May 16 or until the group block is sold-out, whichever comes first. To make a reservation online, please visit http://embassysuites.hilton.com/en/es/groups/personalized/S/SFOPHES-PC6-20150609/index.jhtml?WT.mc_id=POG. To make reservations by telephone, please call 800-498-7397 and request Group Code PC6. To make reservations by email, please email john.aliamus@hilton.com. VALET PARKING: $12.00 (Discounted from $20.00). When you make your reservation, the $20.00 charge will appear on your bill, but it will be discounted at check-out. SELF-PARKING: Self-parking is not available. 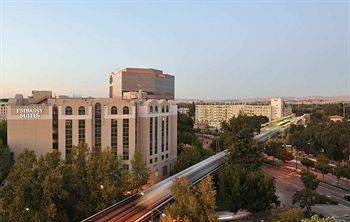 BART: The Embassy Suites Walnut Creek is a two minute walk from the ﻿Pleasant Hill/Contra Costa Centre BART Station﻿. A direct BART metro link from/to San Francisco (SFO) and Oakland (OAK) airports is directly across the street from the hotel entrance. BART is a very, very convenient way to travel from the San Francisco Bay Area airports!